Hercules-Campbell was a commercial body builder and distributor headquartered in Tarrytown, New York with sales & service depots in Cambridge, Massachusetts (at 130 Brookline St.); Portland, Maine; Albany, New York; Berlin, Connecticut; North & South Kearney, New Jersey; and Jamaica, Long Island, NY. 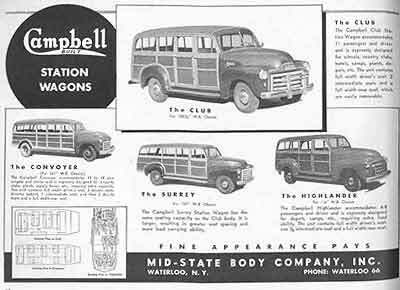 The firm was owned by Robert Campbell and had a close association with Campbell's Mid-State Body Co. (1932-1957), a wooden station wagon body manufacturer located in Waterloo, New York. Mid-State's bodies were often marketed under different names which included Campbell, Campbell-built and Campbell Mid-State. Campbell expanded the Waterloo operation in 1939 and Hercules-Campbell used part of the facility to assemble school buses and other large commercial bodies. In the early teens, the Hercules Body Co. of Evansville, Indiana started building wood-framed stake bodies, jitneys, express bodies, delivery vans and depot hacks for Ford Model T and TT chassis. 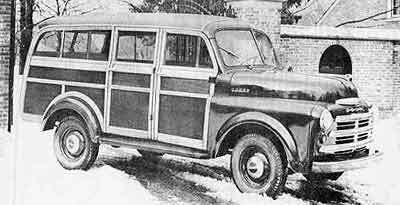 As their metal-braced wooden bodies were easily adapted to other chassis, Hercules soon offered separate catalogs for Chevrolet, Dodge, Fargo and Ford light truck chassis. During the 1920s, Hercules, now known as Hercules Products Inc., expanded into the manufacture of all-metal dump bodies and trailers, tractor trailers, insulated route delivery bodies. Robert Campbell of Tarrytown, New York became a Hercules Body Co. (of Evansville, Indiana) distributor in the late 20s, and within a few short years, would start manufacturing his own commercial bodies. During the next decade the Hercules-Campbell Body Co. established satellite sales branches in Cambridge, Massachusetts (at 130 Brookline St.); Portland, Maine; Albany, New York; Berlin, Connecticut; North & South Kearney, New Jersey; and Jamaica, Long Island, NY. Crated and disassembled (knocked-down) Hercules commercial bodies were shipped by rail from Evansville to Campbell’s Tarrytown plant where they would be assembled and installed on waiting chassis. As Chevrolet had a final assembly plant located a few miles away in North Tarrytown (now called Sleepy Hollow), quite a few Hercules bodies ended up on the automakers chassis. Once varnished, Hercules’ station wagon bodies could not be knocked-down for shipping and were transported inside freight cars on special dollies. 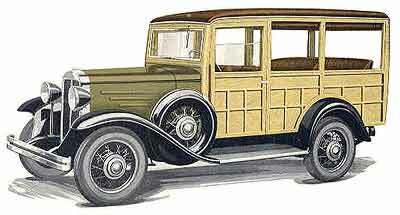 In the early days of the Depression Campbell realized that he needed to find a less-expensive source of suburban station wagon bodies in order to compete against the budget-priced Ford Model A. Henry W. LeClear, the manager of Waterloo Bodies Inc. had been acquainted with Campbell for a number of years and let him know that he was looking for a job as his Waterloo, New York employer was closing its doors. The bodies coming out of Waterloo were more streamlined than the dated bodies Campbell had been purchasing from Evansville. Mid-State’s suburbans featured crankdown windows in the front doors and canvas side curtains all around. Some were even fitted with removable storm glass windows which were available on special order from the Tarrytown factory. 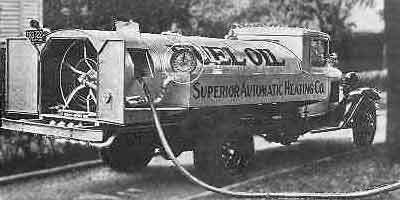 Hercules-Campbell was a distributor for a variety of commercial body manufacturers including Cresci & Universal (hydraulic hoist coal & coke bodies), Kingham (trailers), Morrison (utility bodies), Gramm (panel vans), Wayne Works (buses) and Campbell (their own line of stake bodies and truck tanks – built by a third party) and Campbell Mid-State (station wagons). 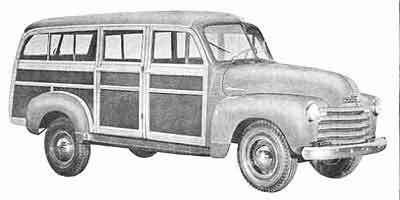 Following the relocation of Hercules-Campbell’s Tarrytown plant in 1936, a new streamlined station wagon body was developed using a greenhouse equipped with crank-down windows in all 4 doors, sliding windows in the rear quarters and a new one-piece liftgate. It was designed specifically for the Chevrolet chassis, and transporters loaded with new Chevrolet cowl & chassis soon began arriving from Chevrolet’s Tarrytown plant. Once they were fitted with coachwork in Waterloo, they were shipped back to Hercules-Campbell’s Tarrytown holding yard where they would be picked up by drivers and delivered to their final destinations. "When I was a kid, I lived a block away from where these woodies were made, and I'd see them being driven by, day after day after day. I'd see them come one way, and all they'd be was the chassis with a windshield and, literally, an orange crate. Then I'd see them coming back the other way with the body on." For many years the Geneva Body Co. - another central New York firm located just 6 miles away in downtown Geneva, New York - had been supplying production sedan delivery bodies to Chevrolet. When its owner died in 1939, Campbell purchased the firm’s equipment and installed it in a group of buildings that had formerly been occupied by the Geneva, Seneca Falls and Auburn Railroad Co. a small interurban that had closed down in 1928. Mid-State’s new plant gave them instant access to the Lehigh Valley Railroad and even allowed them to load freight cars from inside the factory. Many of Geneva Body’s employees, including its foreman, Henry Mosher, (plus his father and brother) followed the equipment to Geneva where they were put to work at Mid-State. The firm’s new W. Main St. plant was initially used to assemble large commercial bodies and Wayne Works school buses which were purchased in knocked down form, but in a few short months, it would be producing station wagon bodies for Chevrolet. Karl Bernhardi (1904-1997) had started working for Robert Campbell in 1928 and by the mid-thirties was superintendent of Hercules-Campbell's Tarrytown plant. He moved to Waterloo in 1939 to help Henry Mosher (1901-1991) streamline production of Mid-State’s Chevrolet station wagon bodies, eventually becoming general manager of the Waterloo operation in 1942. He was assisted by the plant superintendent, Bill Richardson, and department foremen Henry W. LeClear, Carl Carlson and Warren Raynes. When the Waterloo plant closed down, Bernhardi formed KB Truck Equipment Co., a firm that would eventually become Central New York’s largest truck body distributor. Starting in 1939, General Motors started offering production station wagon bodies for their Chevrolet, Oldsmobile and Pontiac Divisions. 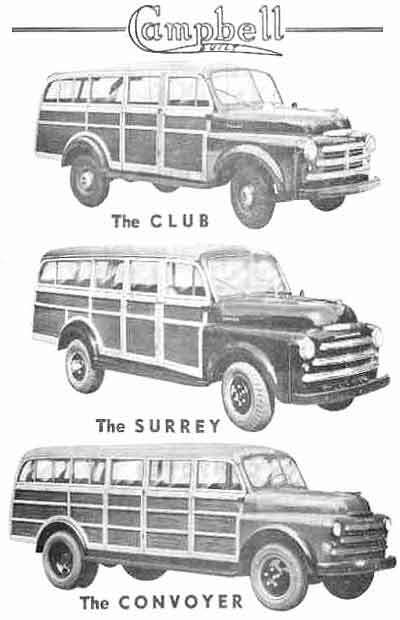 As all three utilized the same 8-passenger bodywork, GM split the contract between Cantrell, Hercules and Ionia. 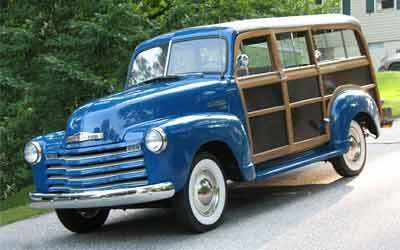 Chevrolet‘s wagon was considered a commercial vehicle and was available on the Master 85 or Master DeLuxe chassis. 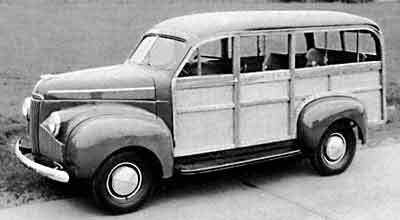 The Wagon featured seating for eight, had removable seats, ash framing with natural birch plywood paneling, a padded brown leatherette (synthetic leather) top, four doors and a heavy wood tailgate with snap-on rear curtains. An upper lift-gate could be optioned. It was a limited production model and it its first year only 430 Master 85s and 989 DeLuxe wagons were sold. Only a handful are known believed to exist today. 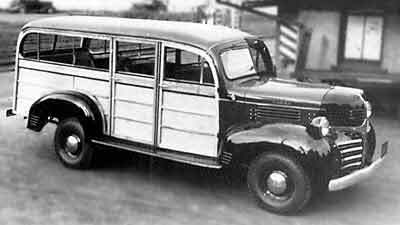 In 1940, the Station Wagon was once again available in the Master 85 Series and a new Special DeLuxe Series where leather seats were available at extra-cost. According to Karl Bernhardi, Campbell-Midstate joined the GM program in 1940, producing bodies for Chevrolet’s Baltimore MD and Tarrytown NY assembly plants through 1941. 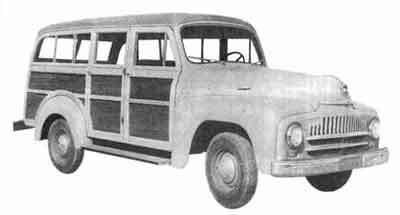 Campbell’s bodies used birch paneling and were indistinguishable from those manufactured by Cantrell in Long Island. 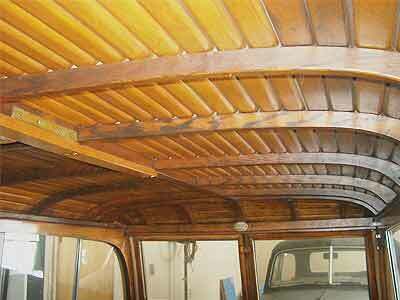 Although Ionia’s bodies used birch paneling as well, their ash framing featured three horizontal ribs per panel instead of the two used by Campbell and Cantrell. 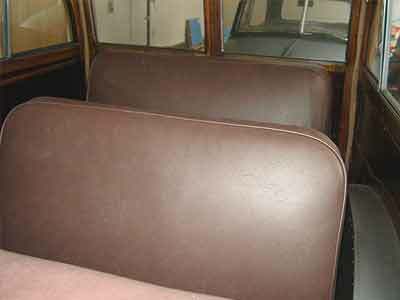 Hercules Body Co. also made station wagon bodies for Chevrolet, however their bodies used distinctive mahogany paneling setting them apart from the lighter birch-paneled Campbell, Cantrell and Ionia products. All four manufacturer’s wagons shared a leatherette-covered padded roof and a horizontally split tailgate, which included a single window on the top and a built-in folding tray on the bottom. Once the bodies were completed, they were attached to special carriers that allowed them to be rotated in a vertical orientation so that eight bodies would fit inside a single freight car. At the peak of production, three freight cars full of bodies left the W. Main St. body plant every day. Although the plant had just completed re-tooling for the new 1942 Chevrolets, the contract was cancelled immediately following the December 7th, 1942 attack on Pearl Harbor. According to Bernhardi, GM reimbursed them for losses incurred by the retooling, as well as their stockpiles of unused body parts. 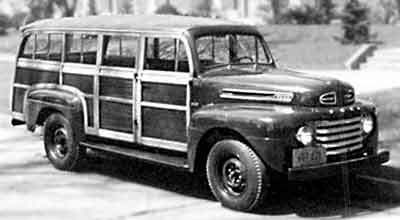 In 1941 Campbell Mid-State introduced an all-new line of beefed-up suburban bodies for heavy-duty ¾- (Highlander) and 1-ton (Surrey) light truck chassis. Originally intended to keep the factory busy between the 1941 and 1942 model year changeover, they now became the first products in Campbell Mid-State’s new line of “War Wagons”. According to a May 1943 confidential dealer price list, the bodies were available for 1940-1942 Ford, Mercury, Chevrolet, Plymouth, 1941-42 Pontiac, Studebaker and 1942 Doge and Desoto passenger car chassis. 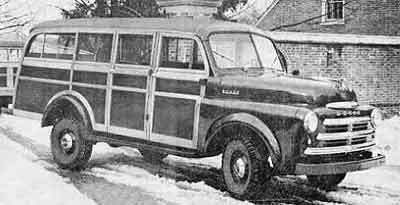 Regular wheelbase station wagons were available for $450 fob, Waterloo, NY however a 14-passenger Campbell Commuter body was available for $1000. Another line of bodies were offered for mounting on light and medium duty truck chassis only. “Chassis must be supplied complete with Windshield-Cowl, Instrument Panel, Instruments, Front Door Hinges, Windshield Wipers, Front Mat, Full-length Running Boards, Rear Fenders, and Rear Bumper. EXCEPTION, Omit Log Running Boards and Rear Fenders on TRANSPORTER only. At the beginning of the War, Hercules-Campbell was commissioned by General Motors to convert 200 brand new Chevrolets into station wagons for the war effort. 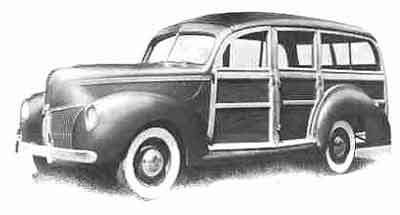 The cars were shipped to Waterloo from Chevrolet’s Tarrytown plant and Mid-State’s crew wrestled the 2- and 4-door passenger car bodies off their frames and installed 200 8-passenger Campbell wooden station wagon bodies in their place. The need for civil defense vehicles increased as the war wore on and station wagons conversions became the firm’s main source of income. Although Campbell used whatever chassis were available, Chevrolet’s remained the chassis of choice. One popular conversion used a 14-passenger Campbell Commuter body mounted on an extended wheelbase (by 24”) Chevrolet passenger car chassis. Another Campbell favorite was Chevrolet’s 1 ½-ton truck chassis, which came standard with dual rear wheels, making a much more stable mount for the firm’s Commuter and Convoyer bodies. The Campbell shops also built a few large camouflaged buses using knocked-down bodies sourced from Wayne Works as well as a large number of overseas shipping cases for WWII bomber engines. A few smaller projects were undertaken such as the manufacture of wooden playpens, plywood boats and a short run of red, white & blue 3-wheeled toy airplanes. As new chassis were impossible to find in the immediate post-war era, many of the firm’s bodies continued to be mounted on used passenger car chassis. A Philadelphia car dealer had Campbell remove taxi-cab bodies from 200 pre-war Plymouths and replace them with station wagon bodies. Late model commercial chassis were more readily available and quite a few Dodge and Fargo (Dodge export, usually right-hand-drive) light trucks were fitted with Campbell Commuter bodies following the war. On December 19th, 1947 a fire engulfed Campbell Mid-State’s W. Main St. complex that was confined to the building that housed the firm’s paint and station wagon assembly departments. The combined efforts of the Waterloo, Geneva, and Seneca Falls Fire Departments helped save a second large building located directly to the east and the loss was limited to $150,000, which included the building and 20 station wagons bodies being built inside it. 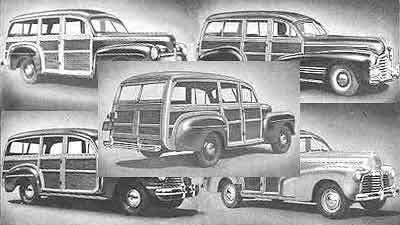 By 1949 the market collapsed completely for Campbell’s passenger car-based station wagon bodies. 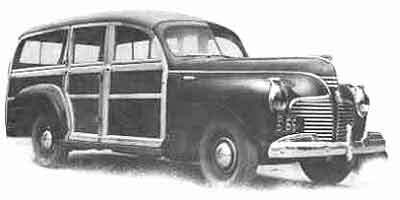 General Motors introduced a new composite steel and wood body for the 1949 model year, effectively putting and end to Campbell’s long association with Chevrolet. 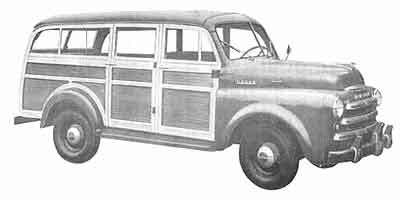 Other manufacturers were develpoing all-steel station wagons whose faux wood exterior panels were actually made from plastic and wood-grained vinyl (Di-Noc). Luckily the firm’s commercial body business improved, in a large part due to an expanded international market brought on by the collapse of the European auto industry. 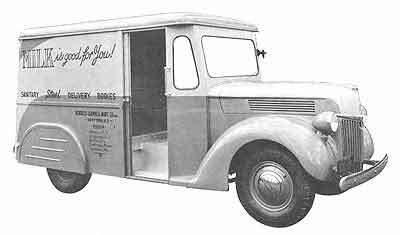 Campbell’s Commuter and Convoyer bodies were mounted on a wide variety of chassis, Chevrolet, Dodge, Fargo, Ford, International and Mack. “Mid-State Body company cut back its work force to three or four employees Friday. The company had employed about 50 men. A company spokesman said that because of changes in school bus speculations, the Mid-State company plans to close out operations within 60 to 90 days. The company had been assembling buses tor the Hercules-Campbell Body Company, the spokesman stated. 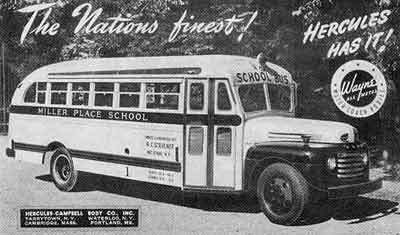 In the future, however, all school buses will be purchased fully assembled and ready for delivery from the Wayne Works, Richmond, Ind. “In the past, the Hercules-Campbell company, a school bus sales company with an office here, has sold buses bought fully assembled from the Wayne Works, or unassembled for sub-contracting to the Mid-State company. With the current confusion overstate specifications, the Hercules Campbell company is no longer going to have Mid-State assemble buses here. “Confusion over the state regulations on school buses, effective Jan. 1, have delayed regular school bus purchases and the company believes it can carry out its operations for the present from its Albany plant. “Although the situation is not cut and dried, the spokesman stated that there is little likelihood that the plant will reopen when the bus situation returns to normal. However, the Campbell-Vincent real estate company owners of the building, are reported doing all possible to lease the building to another manufacturer. The Hercules-Campbell Body Co. of New England had been operated by Robert Campbell’s daughter and son-in-law as an independent firm for a number of years and survived the bankruptcy. Robert Campbell retired to Yarmouth, Maine and passed away on August 30th, 1957 following a short illness. His daughter’s firm survived as a truck body distributor into the 1960s. Roger Mack - 1987 Interview with Karl Bernhardi - "The Life & Times of Waterloo's Own Legendary Wooden Body Company"